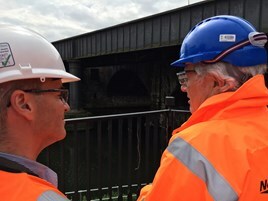 A relative of railway pioneer George Stephenson visited the Ordsall Chord construction site on June 9, to view the latest progress. Architect Roger Stephenson was invited to hear about restoration plans for his predecessor’s bridge, and how it will be brought back to life when the chord opens in December 2018. The current Girder Bridge, which hides the structure, will be moved and the original 1830 structure restored. A footbridge will be built over the River Irwell to allow the public to see the bridge at close quarters. A new bridge will be built next to it.